at this year's scottish bike show, i stayed in the crowne plaza hotel, but a stone's throw from the scottish exhibition and conference centre (secc). admittedly that stone would need to have taken a slightly convoluted trajectory in order to reach even one of the side doors, and it's highly likely that those very nice security guards (afternoon lads) would not have looked favourably on my throwing of stones in the first place. if memory serves, i had a room on the eighth floor, and though a stunningly fit chap such as myself could easily have reached number eight in a few athletic bounds, i confess i was unable to find the entrance to the stairs from the hotel lobby. an hotel as salubrious as the crowne plaza made me feel uncomfortable enough as it was (in the fish out of water sense, certainly not by any failing in the quality of the accommodation or food); i had no intention of exaggerating that sensibility by eccentrically wandering lonely as a cloud looking for the stairwell. so i took the elevator. and one of those elevators has a window on one wall allowing for an excellent, if brief, view along the river clyde. the largest object filling that view is the infamous finnieston crane. 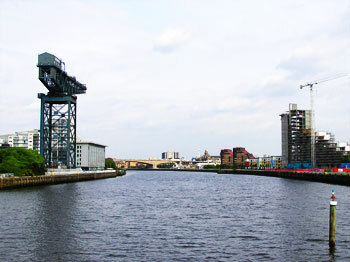 this construct, commissioned in 1926 was completed six years later, and though officially known as the stobcross crane, its proxiity to finnieston quay has led to its more common referral. it was connected to a spur line of the stobcross railway with the main purpose of lifting heavy machinery; quite frequently steam locomotives built at springburn being exported by ship. with the rapid decline in not only locomotive construction but pretty much all of glasgow's heavy industry during the 1960s, use of the crane diminished until it ceased to be employed in the early nineties. nowadays, it's a category a listed structure, left in place as a testament to what once was. glasgow, the clyde and subsequently most of scotland no longer is the industrial hub it once was, a blight that can be seen throughout the uk. there is, however, something of a resurgence in having things made on our/my very doorstep, a very gratifying situation that i will shortly be dealing with in greater detail. meanwhile, a product that arrives in a card box proudly bearing a printed logo that declares handmade in glasgow comes from a workshop adjacent to glasgow's the bike station at yorkhill. 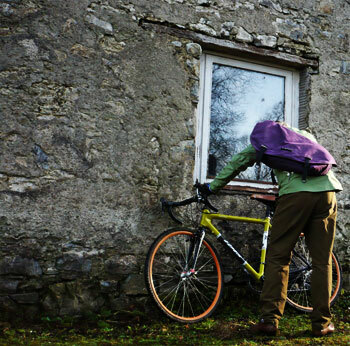 here, alec farmer set up trakke bags and with the skills of james, a former sailmaker, they produce several styles of handmade bags and rucksacks for the cyclist about town and country, constructed from waxed cotton and, a tad more expensively, harris tweed. the photos on the trakke website look particularly impressive but, unwilling simply to take alec's word for it, i asked if they'd mind sending over one of the messenger bags for a short holiday on islay. that's where that card box with handmade in glasgow joins the story. the finnieston crane has nothing on these. constructed from heavyweight waxed cotton (purple, in this case), the bag is flipping enormous; you could move house without ever calling on pickfords. there's a full depth flap closing in on the bag's contents, kept in place by substantial quantities of velcro and two insanely clever straps and stainless steel buckles. embarrassingly, it took me way too long to figure out the simplicity of those buckles, resulting in a cluttering of places that i should not have been cluttering. 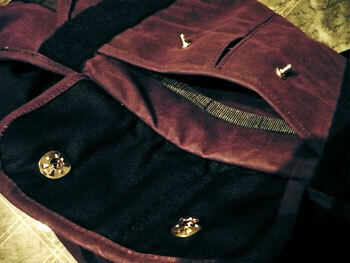 complementing the huge internal space is a full width set of three pockets, topped by a large, zipped security pocket. on the outside, but still under the flap is an expandable full-depth pocket, the flap of which is kept in place by two stainless poppers. trakke bags, in particular, the mule, are apparently customisable, so it may be possible to have alternative additional pockets. in my relatively brief use of the bag, i'd be inclined to have a small pocket added to the enormous outer flap in order that i might have access to small items without opening and closing the whole thing. either that, or a pocket on the main strap, should such be possible. and while i'm on the subject of that main strap, it maintains the company's trademark of building like there's no tomorrow. 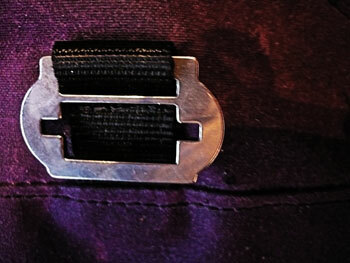 the buckle is apparently the very same as used by paratroopers; it's occasionally a bit finicky to release, but there's never any danger of the bag succumbing to gravity even when jammed to the gunwhales with stuff. and heavy stuff at that. the strap connects from bottom right, slipping over the left shoulder and fastening just below the collarbone. 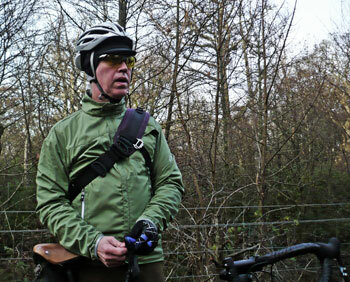 it's very easliy adjustable, even when riding, and the whole kit and caboodle is kept from sliding about by a tag strap connected to the bottom left, hooking onto the main strap from under the left arm. it is conceivably a disadvantage if you'd prefer to have the strap sit over the right shoulder, but i have little doubt that trakke could build one of those on request. mrs washingmachinepost and i are bereft of a motor car, and have been (deliberately) for several years now. there are times when this is a perceived disadvantage, but for the most part, we survive rather well. however, a mere three miles from washingmachinepost cottage is the hamlet of bridgend which features a rather fine spar shop and freezer shop. in the days when the household was motorised, we would often visit the latter on a saturday morning for the excellent choice of frozen products, in particular and entire chest freezer full of vegetarian food, none of which can be acquired in the local supermarket. in fact, the store contains a sizeable number of products unavailable more locally, but without a motor car, we have rarely visited in recent years. while in possession of the trakke mule bag, it seemed an excellent idea to test the veracity of the bag's enormity by visiting and purchasing a wide and numerous variety of deirable foodtsuffs. this turned out to be one of my better ideas, for the number of boxes it is possible to fit inside the trakke messenger bag has to be seen to be believed. even better, the system of straps keeping the bag in place are obviously the result of a carefully thought out cunning plan. 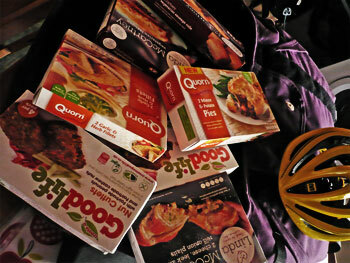 i have positioned a couple of photos depicting my purchases over the course of two weekends, and even with so much filling its internals, the bag never moved a centimetre even in the process of standing on the pedals uphill. movement is virtually nil. it turns out that the mule is also something of a conversation piece, and in the course of discussion, the cost of the bag has often arisen, leading to one or two sharp intakes of breath. £240 is indeed a substantial amount of money to pay for a messenger bag; it's more than many would consider spending on a bicycle. however, let's place this in context; it's entirely and excellently made by hand. cut from a large chunk of waxed cotton by hand, sewn together on a singer sewing machine, while all the straps, buckles and poppers are subsequently added by the same method. 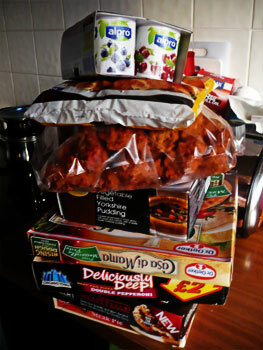 the process is somewhat labour intensive, but believe me, this will last longer than i will. i think it highly unlikely that we can benefit from the so-called luxury of handmade while expecting to pay the price of mass production. 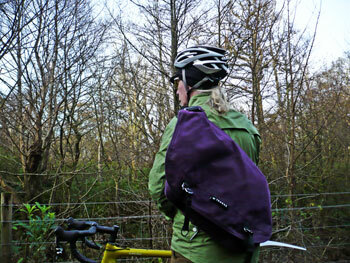 and it's also very unlikely i can emphasise enough just how incredible the trakke bags really are. if there's even the slightest chance that you think either a rucksack or messenger bag would absolve you from the indignity of driving to the supermarket midweek or at weekends, i'd get on the phone or website to trakke right this minute. cities such as portland in oregon take this sort of thing for granted. in portland town, you can acquire a full set of handmade everything, from bikes to bags, from jerseys to wheels. it warms the cockles of my rear derailleur that the same opportunities are within reach in scotland. i don't like to preach or appear overly parochial, but i think it right and proper to support home-made industry, particularly when it is this good.